Spiritbound has just recorded three patriotic American anthems and one new song written by Philip Calder, Russ Evers & Luke Woodard. Listen to sound clips below. The cost for this CD is $10 and comes free with the 15th Anniversary Collection Box Set. For information on ordering this CD or, call 1-800-879-9669 or for scheduling information, email Joel Williams at joel@spiritbound.com. Listen to music from SPIRITBOUND's most recent album. We have purposefully recorded songs of different styles that allow us to effectively minister to the diversity of your church family, touching every age. All songs can be heard using RealPlayer. Click the RealPlayer icon below if you need to download RealPlayer. For scheduling or product information as well as feedback on the new music, contact Info at 800-879-9669. Please provide us with some information about yourself by clicking here. "From the beginning in 1986, churches have been the heart of our ministry. God has called us to encourage and strengthen His people in their walk with Him and to introduce the lost to the Savior. 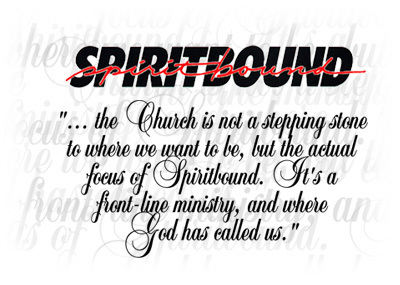 We would love to talk with you about how SPIRITBOUND's music can work together with you to create an environment for growth, acceptance, and love in your church." © 1999-2002 Spiritbound, Williams & Associates, Inc.